In order to whet appetites for the new Fuelband SE, which hits shelves tomorrow, Nike released its companion app, the refreshed Nike+ Move, to the public a day earlier than expected. 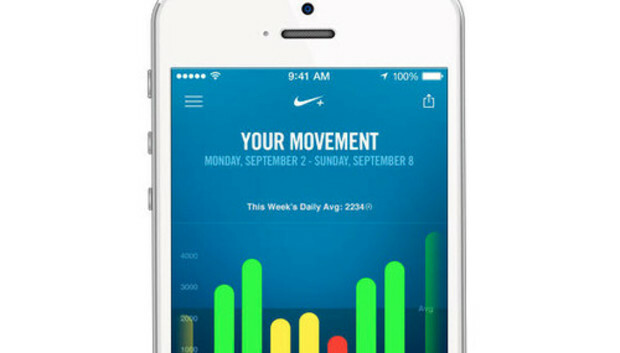 Exclusive to iPhone 5s owners, the Nike+ Move app uses the M7 coprocessor found in the iPhone 5s to gather information from the phone's compass and accelerometer. The data is then converted to NikeFuel by the app, meaning that iPhone 5s users can participate in Nike's fitness ecosystem without necessarily having to purchase a separate piece of hardware like the Fuelband at all. Nike's proprietary points system, NikeFuel, lets you earn "fuel" through all kinds of activities, more than just taking steps or climbing stairs. Nike describes it as the "first ever single universal unit for measuring all kinds of activities," and it's designed to reward you for movement, regardless of your age, weight, or gender. So, it doesn't matter if you're 19 or 79, running four miles will earn you the same amount of NikeFuel. The app is strongly organized around friendly competition--in addition to trying to "win the day" by beating your previous NikeFuel average, you can watch your goal ring change colors as you progress, and compete against friends either through the app or through Apple's Game Center. Additionally, the app can tell you when you're most active during the day and give you a breakdown of walking, running, and other movement. The free app capitalizes on the efficiencies made by the M7 coprocessor. The ability of the iPhone 5s to collect these metrics without any additional hardware could be viewed as Apple upping the ante on Samsung's S Health, which enables step tracking via a pedometer function on the Galaxy S4 and Note 3.